I love the new trailers !! Although I am still waiting for the old fashioned Disney Classics traier, which I am presuming by now is never going to come ? But one thing that does fill me with dread though; it seems all of my friends have absolutley NO IDEA about this movie. They say they havnt seen the trailer in theatres, and only occasionly seen the teaser poster of all the hair. Disney needs to step up on this and get cracking promotion-wise. There were only two different dolls in Harrods toy department as well, standard Rapunzel and Flyn. Although I took a break for Fantastic Fest, I had promised all the interviews from my visit to Walt Disney Animation Studios earlier this month. So, here is my one-on-one with the legendary Alan Menken, who wrote the music for Tangled and worked in the golden age of Disney animation in the early ‘90s. Join me after the break for the full transcript and a few highlights. What era inspired the music for Tangled? Did he always have the passion to be a composer? - He started out as a pre-med at NYU, but he always wanted to compose. - He didn’t know how to go down that path. How did Donna Murphy and Mandy Moore fit in? - He had worked with Donna in the past and she brought theatre experience. - Mandy had the exact vocal characteristics they were looking for. Collider: So, this is crazy. You have eight Oscar wins. Alan Menken: I know, isn’t that crazy? Menken: Alive… but you know, the truth is, let’s face it. Meryl Streep has 16 nominations. I mean, to me that is truly extraordinarily impressive. I’ve been very fortunate as a composer to be involved with projects that have really propelled my scores forward. I’m very proud of it. If I was fortunate enough to be nominated again, I’d be thrilled. You have been working with Disney for a while now, but you had a bit of a break or a lull. Menken: Well, I didn’t really take a break. I think the animated musical goes through cycles. So we had this early cycle with The Little Mermaid and going all the way through Hercules. That played itself out and I think people wanted more rock-star driven animated things where it was almost like jukebox type of animated films. I guess Enchanted was the return to the classic styling. And Tangled is a semi-return because I think it was very conscious of wanting this to also be a new breed of musical. I was reading your history and you were actually a pre-med student at NYU. So, what drew you to Disney and musicals? Menken: I was not successfully pre-med. [laughs]. I always wanted to be a composer and I sort of went in to NYU as pre-med because I just thought, well… who actually becomes a composer? So you always had this passion? Menken: Oh yes, always. This is the passion of my life. So, out of college I began my music career. Before I came to work with Disney, I wrote Little Shop of Horrors and other musicals. What brought me to Disney was the new regime, which is now the old regime, came over with Michael Eisner, Frank Wells, Jeffrey Katzenberg, and all these people really wanted to reinvigorate the animated musical, so they came to Howard Ashman and me. That was my entry into Disney. You were part of the golden age. Menken: That was very successful and we just continued. I think the success of these animated musicals kind of took people by surprise a bit. I don’t think anybody knew how big the hunger was for a return to those tunes and that kind of romantic simplicity, and also bringing musical theater values to film. So, we said, “People like this, so let’s keep doing it.” When the box office went down, they kind of thought, “Enough of this, let’s try something else.” That’s inevitably the way things are going to go. You have done a ton of different styles for Disney, but what era of music would you say influences you the most? Menken: Well, I’m always influenced by the specific style that we choose that will illuminate the story. In terms of Tangled, the styles I chose… I didn’t want to go to the styling of The Hunchback of Notre Dame, which is another story of somebody trapped in a tower, but clearly that was gothic and music of the church and French classical. I wanted folk rock on this. I thought about her long hair and the freedom she wanted. I immediately thought about Joni Mitchell’s Chelsea Morning and all that folk music that I love. Cat Stevens and that energy. I just felt like that would be, on a gut level, a fresh palette to bring to this. So, that was really our way into the score. So the movie obviously influences whatever styling you bring to the table. Menken: Well, they had barely started the movie at that point. It was the story and the characters’ sketches that inspire a story-telling device. When we did Hercules and we brought in gospel because it’s in praise of God and Hercules was among them. That was an arbitrary choice but it worked nicely for that particular story. Everyone one of the projects I have done has had a different musical palette that I drew on. Everyone really wanted something that was fresh, that was contemporary, that could be fairy tale and yet not be kind of little girl fairy tale. 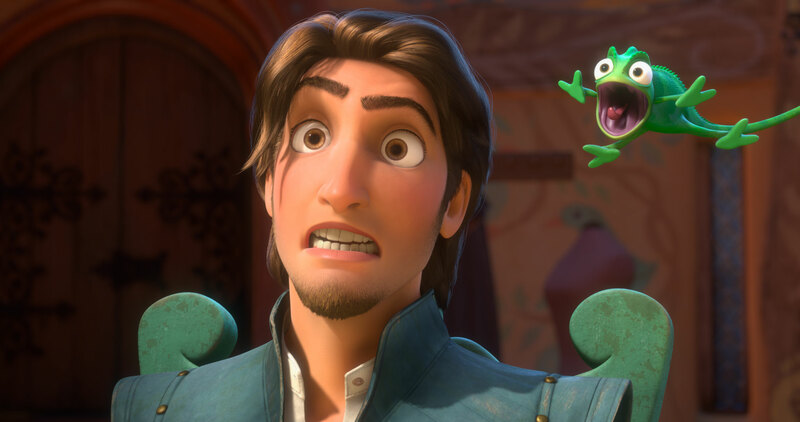 So how did you get involved with Tangled? Menken: Rapunzel had been around for a long time, and I had no idea it was going to come my way. I think we had just finished Enchanted and I had done Shaggy Dog and we were developing a few things, and then the call came. They wanted to talk about Rapunzel, so then we started taking meetings and talking, and then I brought Glenn Slater on. Once we started, they really wanted to get this out fast. So the songs were all basically written in under a year. Many song choices and then they were storyboarded. The last song to get written was the Incantation which runs throughout the movie. The first one that was written was When Will My Life Begin. What did Donna Murphy and Mandy Moore bring to the table? Menken: Well Donna brought musical theater expertise. She’s a wonderful actress and has won two Tony awards. I’ve known Donna for a long time; in fact she was one of our Audreys in Little Shop of Horrors way back. So Donna brought that kind of drama. Not really connected to Donna, but connected to the story, Glenn Slater and I wrote something that was very musical theater oriented for Mother Gothel and her song, Mother Knows Best. Mandy brings that wonderful quality that’s totally compatible with Rapunzel. This voice that’s light, airy, and yearning. She’s adorable, and Rapunzel’s adorable. Frankly, she was a wonderful match vocally for what we wanted for the character. You are constantly developing something new, including the upcoming theatrical production of The Hunchback of Notre Dame. Menken: The main things that are going on is Leap of Faith is opening here at the Ahmanson Theatre on October 3rd. That’s my gospel musical. Sister Act is running in London at the Palladium, and coming to Broadway in the spring. So those are my two, big, active projects, and then there is a stage musical of Newsies, Hunchback, and Aladdin all coming. How do you juggle all of these projects? Do you find it easy? Menken: I find it easy… well, I find it enjoyable and challenging. I’ve always juggled a lot of projects because at least half the projects you do get shelved. So you have to do a lot of things in order for things to move forward. Talk a little bit about how you balance the background score and the actual musical numbers. How do you pace the transition between actual story and a musical number? Menken: We do that together. You look for what is going to be an appropriate song moment for the main characters. But if you look at a song like the pub song, well, you know what? We need a comedy song. We need something that’s going to be more than a solo song. So, the characters were kind of invented to give Rapunzel and Flynn a stop on their journey where we can play out a song opportunity. Mother Knows Best flows directly out of the conflict between them. The lantern song, again, flows pretty much out of the sense of completion and she finally sees the lanterns and has this moment. It’s more of a montage number. So you lay it out against the story and go, “OK, these are the song moments as we see them, do a reprise of this one and two reprise of that one. That seems about right.” There is a musical moment that might have been a song called The Kingdom Dance. When they come to the kingdom and they are dancing, that is kind of a musical moment but also a song moment without words. But structurally, if you write enough musicals you pretty much have a sense of where they should go, what you’ll need, and when; how to pull people on that journey. That concluded our discussion, as I was out of time. Again, it was an absolute thrill to meet the man behind some of my favorite musical tunes from the string of Disney hits in the early ‘90s, especially Aladdin. You can read part 1 and part 2 of my set visit report, and my first interview with Zachari Levy. Check back right here for the last two interviews with Mandy Moore and directors Byron Howard and Nathan Greno in the next two days. So, we know the title of another song "The Kingdom Dance"
"When will my life begin" - Rapunzel. "Mother knows best" - Donna Murphy. "Incantation" - Donna Murphy & Rapunzel. "I don't sing (or the pub song) - Flynn and the pub guys. "The Kingdom Dance" - People of Corona. "I see the lights" - Rapunzel & Flynn. Wow, I didn't know they were doing a stage version of Aladdin! Does anyone know what date they have having the movie premiere at El Capitain? yeah, she looks sunburned in the newer one. Upon having seen the current cinema trailer, dare I say it it all seems a bit too 'Shrek' for my liking [actually I do like many Dreamworks cartoons but I've never been that keen on Shrek]. It just seems to have that smarmy mocking attitude, though of course the CG animation does look very good. I really really hope I'm proved wrong. ^ She shares some UD members' fears about going to a Disney film without kids, though. As someone who has seen the film I am telling you it is nothing like Shrek. NOTHING. Period. End of story. Even though the clip's been around awhile in previews, I never really caught this. I met the voice of Mother Gothel this past weekend! Donna Murphy! =O OMG You're so lucky!!! !